Property 22: Holiday Apartment "Il Sogno di Franco"
Property 23: The house is integrated in the medieval village of Izzalini, close to the Castle. Property 30: House in the quiet Umbrian region with pool and enclosed park. Property 32: Stay in our house mean be the only persons in the structure. 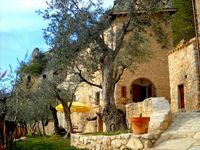 Property 33: Le Bonheur di Todi - Among olive groves and vineyards - Rent it NOW ! Villa Pulce Dorata- 3 bedrooms, 2 bathrooms, 2 living rooms, kitchen. Property 35: Villa Pulce Dorata- 3 bedrooms, 2 bathrooms, 2 living rooms, kitchen. Wow. Just wow. The Guesthouse Runcini was a truly spectacular travel experience. I have travelled a great deal, and this is definitely one of those special places that I would like to return to again and again. Doda is a perfect host, and provided everything (and more) to make our stay comfortable. The 1,000-year old guest house has been beautifully restored and decorated with an artist's keen eye. The guesthouse is in a tiny medieval village, which Doda's husband has been restoring over many years. Although the village church is over 500 years old, many of the frescoes are in tact and the rest has been restored by expert hands. You won't regret making your way to this special place!